Excuse me, did you say Polaroid camera? UPDATE: Welcome Neil Gaiman fans and ultra-large Polaroid Camera fanciers. 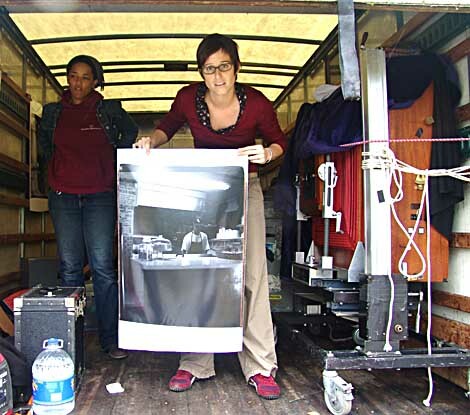 This is an account of the use of a 20×24 Polaroid Camera in a non-studio environment as part of a tour before the camera is decommissioned. Those who have difficulty understanding what is written here should read my note in the comments. 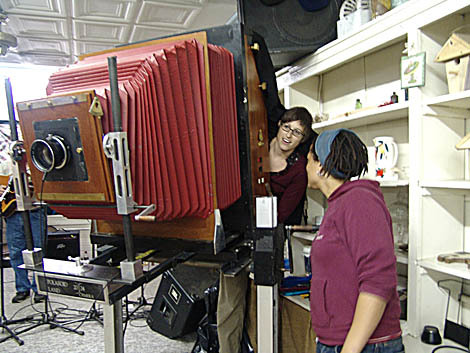 That super-large format camera in this photo is indeed a Polaroid camera, the largest of its kind in the world. It is being operated by Jennifer Trausch and Kim Venable on the dance floor of the Floyd Country Store. the room with a shattering fusillade of staccato sounds. 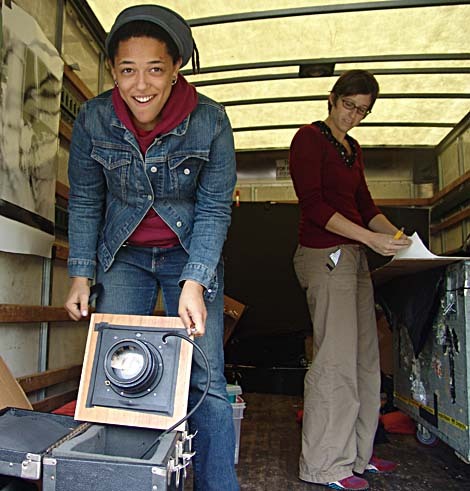 Why these young women are lugging a 250 pound camera around the Eastern United States in a rented truck is a story in itself, but I will confine this article to their valiant attempts to use the world’s largest Polaroid camera to capture images of dancers clogging at the Friday Night Jamboree. Here is a closeup of the nameplate. As you can see, it is immense. Jennifer and Kim gamely manipulated controls and changed lenses in an effort to capture images of the dancers and every few minutes would open the vast doors on the back of the camera and take out a huge sheet of exposed Polaroid film and run up the stairs with it. I did not get a chance to see the images of the dancers, but here is an image Jennifer showed me earlier in the day. As you can see it is a very large format black and white image. I admire their determination to take this camera on one last tour before it is decomissioned and placed in a museum, because like many endeavors I have engaged in, the doing of the deed is as important as the results. Here Kim Venable shows us one of the lenses for this camera. 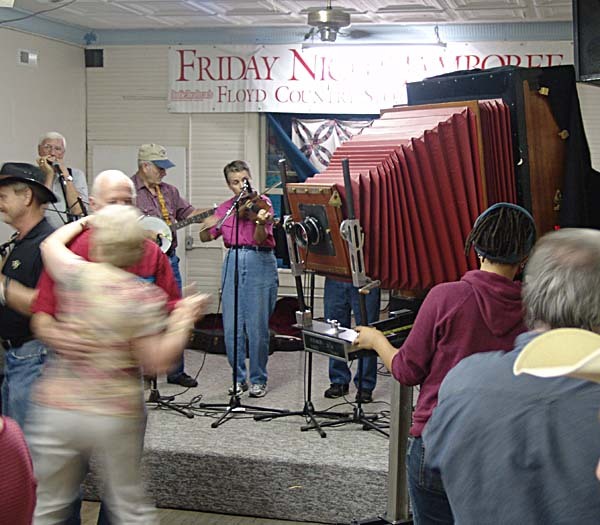 This camera is the last of its breed, a technological dinosaur, and for one glorious moment it was put through its paces at the Friday Night Jamboree in Floyd, Virginia. Many thanks to Woody Crenshaw, owner of the Floyd Country Store for having the imagination to allow these two young women to create this once in a lifetime event in Floyd. If they were successful in capturing a fair image, I will post it here. Stay tuned for more information about this camera and their tour. This entry was posted in Country Living, Seen around Floyd. Bookmark the permalink. 0 Responses to Excuse me, did you say Polaroid camera? I was lucky enough to be at the Store that night, and it was definitely different. Aside from a few dancers’ grumbles about the truly huge camera “takin’ up all their dancing room,” the reactions I saw in the typical Floyd Jamboree crowd were mostly curious and encouraging. And, not to lessen the sheer experience of taking them with the beautiful antique equipment, but some of the developed images were nothing short of amazing. The general dance floor photos were blurry from too much swift movement, but still remarkable. The stop-you-in-your-tracks pictures, however, were the rare portraits the young artists managed to get of local characters who agreed to stand still – albeit briefly, before returning to their dance. I don’t know about this particular camera, but to my knowledge Polaroid has no imminent plans to retire the many 20×24 cameras they have in service, or discontinue the film. Besides which, there are several other sources of cameras of this size apart from Polaroid. The information on the retirement of this camera line came from Jennifer Trausch. Those who continue to speculate and pontificate should go back to the source. Ask the product line manager! This is a still camera. It is normally used for portraits. When I wrote that the young women were valiantly attempting to capture the images of dancers on the dance floor. That is what was going on. These dancers were not posing, they were dancing. They were moving in and out of the field of view. This was a Friday Night Jamboree, not a carefully staged Photo Op. Well Jenn, I should think that if you don’t know the specifics of that which you are speaking about then it may be in your best interest not to say anything. As you would find the “many” Polaroid 20 x 24 cameras that you mentioned are limited to the mere 6 that were produced and licensed by the corporation and as stated in recent news Polaroid will be ceasing production of all instant film products in the upcoming months thus forcing the retirement of the cameras and studios. There very well are other cameras of this size in the world, however this article and discussion is one that is focused around the loss of one of photography’s great pioneers, innovators, and supporters of the photographic arts. This one of the must unique and beautiful products produced and it is the end of a legacy.